‘Twas the day after Thanksgiving and the weather was quite dreary. Raindrops fell from the sky, and the streets of LA were empty and eerie. We had intended to go out for a hearty Southern brunch, but the long lines and a fateful sign put us in the mood for lunch. “Moules frites, foie gras, escargots” was emblazoned over a doorway; we took our names off the waitlist in favor of something much more gourmet. Meet in Paris is a bistro with decor comforting yet chic. 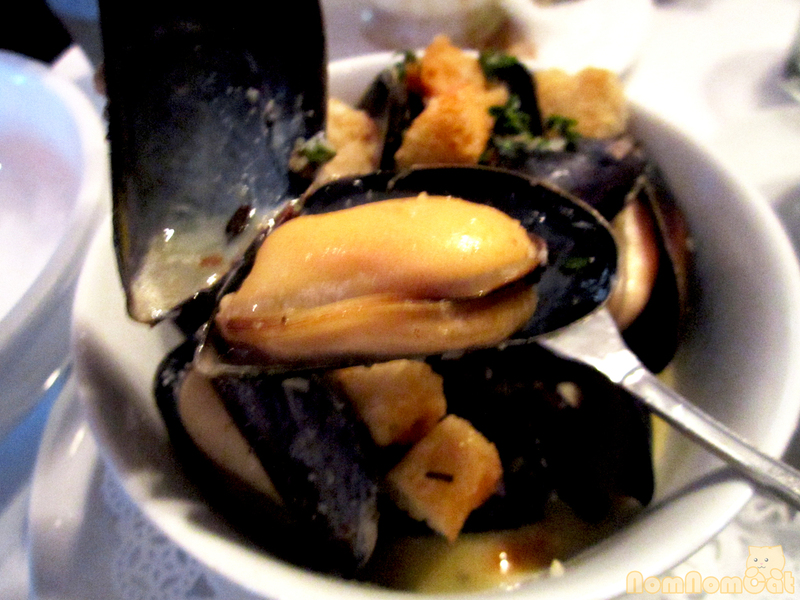 The service was friendly and the mussel options plentiful – c’est magnifique! 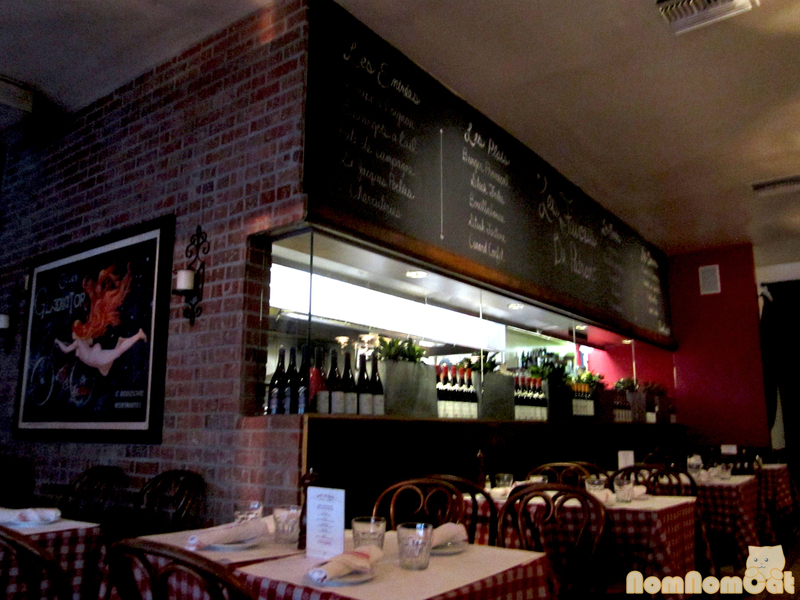 The exposed brick and chalkboard menu made the bistro feel trendy yet casual. I loved the checked tablecloths and white flour sack towels for napkins. The ambiance really came together for me when La Vie En Rose played in the background. Martin and I love the French romantic-comedy Jeux d’enfants (Love Me If You Dare), so when that song played, an otherwise ordinary brunch transformed into a very cute date. 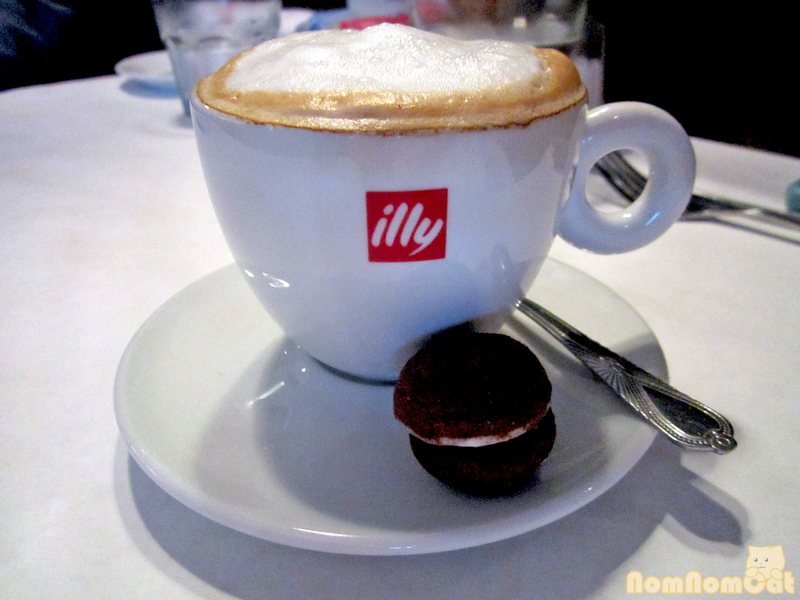 Having spotted that they serve illy coffee here, I could not resist ordering a cappuccino. The coffee was the perfect temperature underneath a thick cloud of foam… the whole experience was made even better by a special little treat — a small chocolate macaron resting delicately on the saucer. It was dense and almost brownie-like in flavor and texture, a great foil to the coffee’s intensity. 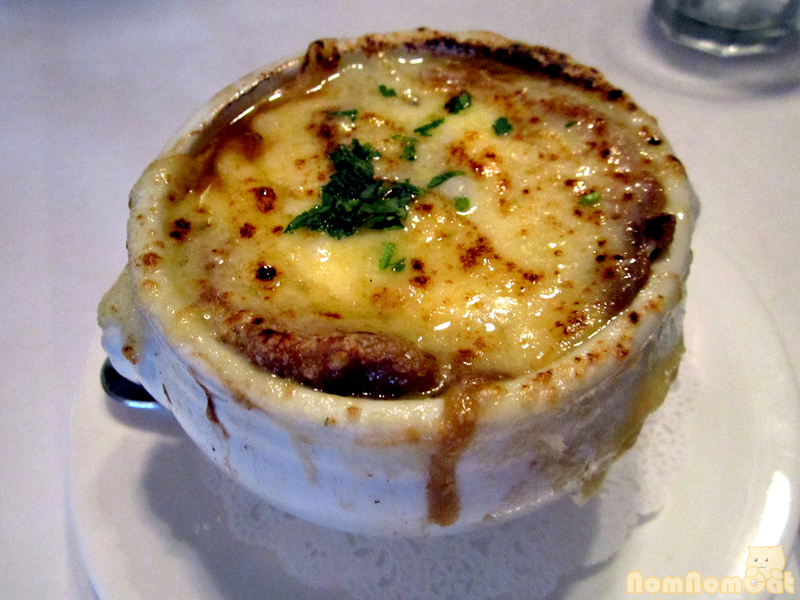 Rainy weather almost always means soup, so we decided to share a bowl of the French onion soup, served appropriately in the lion head’s bowl. 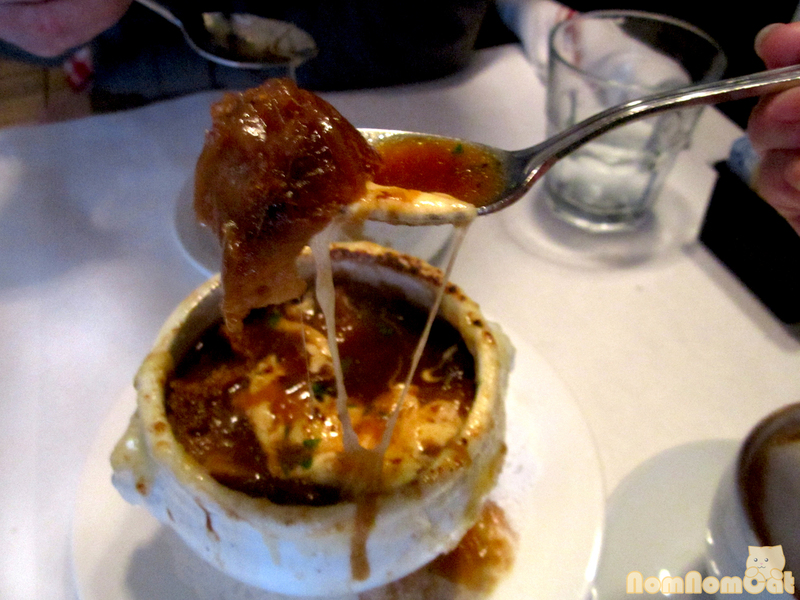 The broth was rich and not overly salted, and the layer of bread just under the cheese soaked in the soup nicely. And of course, the generous layer of melted gruyere made appealingly long strings as we dug in. Martin was in the mood for breakfast so he selected his (and apparently one of the servers’) personal favorite — the croque madame. As our server took his order, she nodded with a knowing smile. 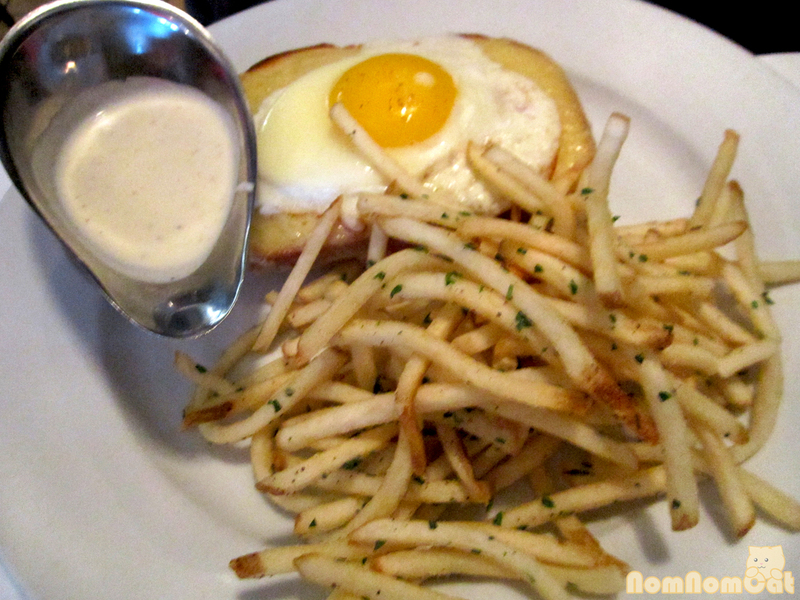 The croque madame is actually never mentioned on the menu; there is only the croque monsieur with an option to add a sunny side up egg for a nominal fee. Referring to it by its proper name almost felt like passing a secret test of sorts. It arrived with a mountain of shoestring frites and a gravy boat of bechamel. The bread was buttery and tasted even better enveloped by the oozy egg yolk and garlicky (?) bechamel. Super filling! 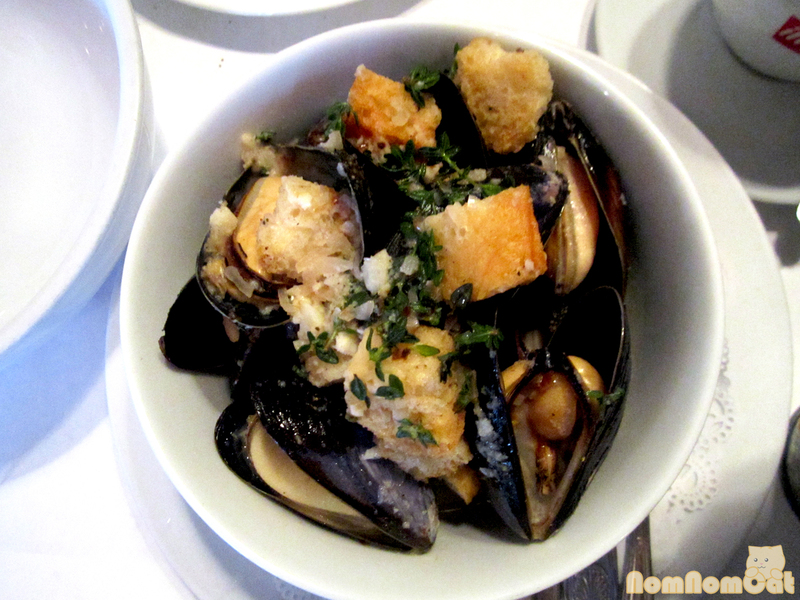 I was overwhelmed by the many options of moules frites with bases ranging from Thai lemongrass curry to Spanish chorizo broth to lobster bisque. Other varieties included smoked salmon (the Alaska), tequila (the Baja), and crab (the namesake Meet in Paris). But I am a firm believer in the beauty of simplicity, and so I opted for the mariniere — garlic, shallots, chablis, and herbed croutons. 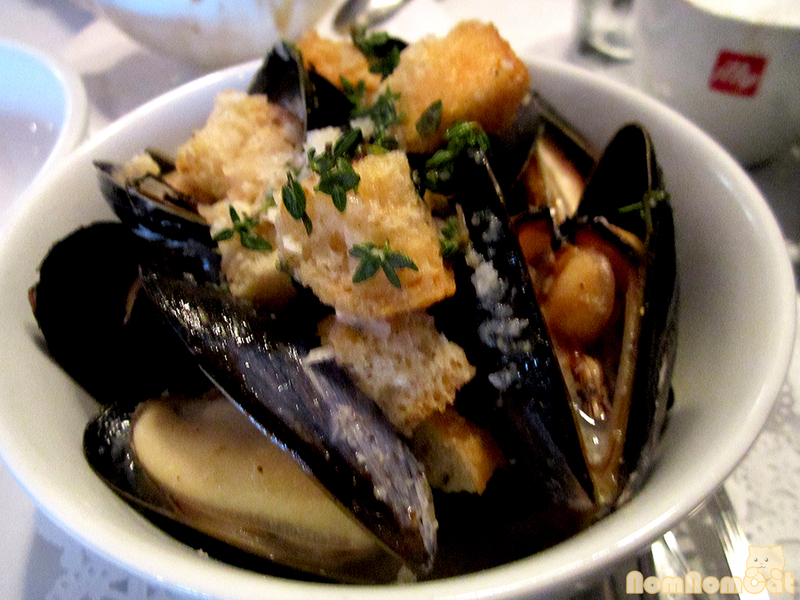 I’ve had PEI (Prince Edward Island) mussels in the past, but the ones here were HUGE. Seriously monstrous. And they were incredibly tender and juicy. 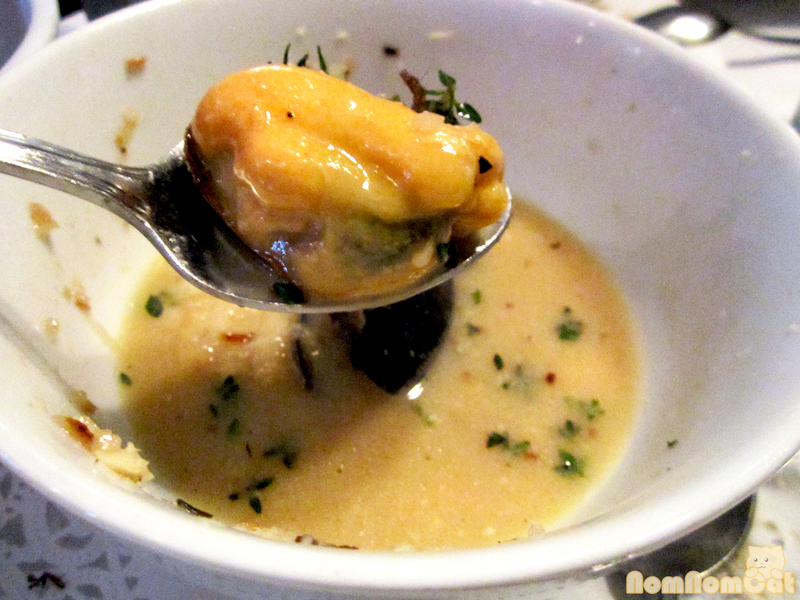 The broth that rendered from the seafood (and butter) was absolutely decadent. I had to take a picture or two just to demonstrate how big and meaty these mussels were. This order is the small and it was the Goldilocks portion for my lunch (just right). Can’t have moules frites without the frites! And the frites… super skinny shoestring fries, these were crispy and salted and reminiscent of Father’s Office frites. 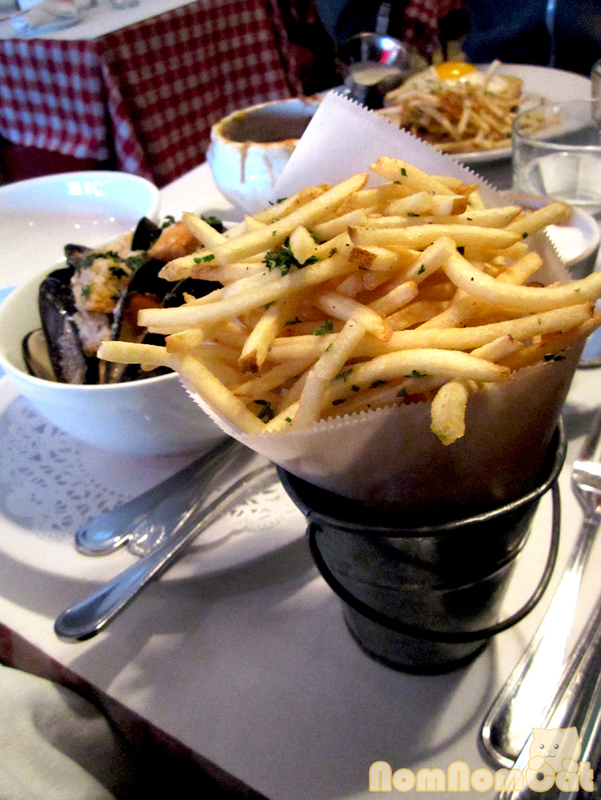 Though our server provided a basket of French baguette to sop up the mussel broth, I really enjoyed dipping the fries. By the way, they do give you the option to order a salad instead, but I say – you just can’t have moules frites without the frites. I noticed many other delicious French offerings on their menu, including steak au poivre (pepper steak) and escargots à l’ail (sauteed in parsley butter), that I’d love to try soon. Like love at first sight, I think we were destined to have our brunch date here and you can bet I’ll be adding this to our list of go-to dinner outings. The perfect spot to rendezvous for your next date night!